My first samples were dyed in Fustic (Chlorophora (or Morus) tinctoria) which comes from the heartwood of a tree grown in South and Central America. It was one of the dyes introduced into Europe in the early 16th century, following the discovery of the sea route to the Americas at the end of the 15th century. 1. Samples of wool, cotton & linen were dyed following the instructions for dark yellow given in Recipe 2 on p114 (YELLOW FOR SILK). However, as the museum already had a sample of silk dyed following this recipe, I had only wool, cotton and linen skeins to dye. This recipe was relatively simple to follow because the measurements are given as percentages. I decided to follow the instructions for dark yellow and to omit the final step using solution of tin. The samples were first mordanted in alum. The wool sample was mordanted using 25% aluminium sulphate and the cotton and linen samples were mordanted using 5% aluminium acetate. The samples were rinsed well then dyed using 100% dried fustic woodchips. This recipe required some calculations in order to adapt it for 10gm skeins. The samples were first worked in a solution of aluminium acetate then rinsed well. A dye solution of 40% dried fustic woodchips (Chlorophora tinctoria) was prepared by simmering the wood chips in water for 45 minutes. The dye solution was strained and the samples were dyed in this then removed. Some of the remaining aluminium acetate solution was added to the fustic dye liquid and the samples were returned & dyed in this for a further 10 minutes. 3. 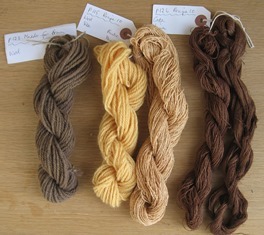 Samples of wool & silk were dyed following the instructions given in Recipe 10 on p115 (BUFF COLOUR ON WOOL) This recipe uses a combination of fustic and madder root. This recipe required some calculations in order to adapt it for 10gm skeins. 10% dried fustic wood chips (Chlorophora tinctoria) and 4% dried madder root (Rubia tinctorum) were simmered in water for 45 minutes and then the dye solution was strained off. Approximately 20% aluminium potassium sulphate was added to the dye bath, which was simmered for 10 minutes then allowed to cool. The samples were added and simmered for 30 minutes. Catechu is another word for cutch, which comes from the heartwood of Acacia catechu, a small thorny tree cultivated mainly in India, the East Indies and Southeast Asia. The dye is supplied as a powdered extract which dissolves in water. It should be mixed and stirred well to avoid lumps. Cutch does not require a pre-mordant. Logwood is also used in this recipe and this comes from the heartwood of Haematoxylon campechianum, a tree grown in Central America. Logwood was one of the most significant dyes introduced into Europe in the early 16th century, following the discovery of the sea route to the Americas at the end of the 15th century. The alum used in the recipe is for the logwood, which does require a mordant. This recipe required some calculations in order to adapt it for two 10gm skeins and some of it had to be guesswork, based on experience. 2 teaspoons of powdered cutch (Acacia catechu) were mixed to a smooth paste with boiling water then added to hot water, to which 1 teaspoon of copper sulphate was also added. The cutch mixture was simmered briefly then unmordanted samples of cotton and linen were added and worked in the solution for 15 minutes. The samples were removed and then 1 teaspoon of ferrous sulphate was added to the cutch dye solution and stirred in well. The samples were simmered in this for 15 minutes then removed and rinsed. 1 teaspoon of logwood chips (Haematoxylon campechianum) was simmered in hot water & then the samples were simmered in the strained-off logwood solution for 10 minutes. They were then removed and half a teaspoon of aluminium sulphate was added to the logwood solution. The samples were simmered in this solution for 10 minutes then removed and rinsed well. This recipe required some calculations in order to adapt it for one 10gm skein. The wool sample was first mordanted with iron (copperas), using a solution made by mixing half a teaspoon each of ferrous sulphate and cream of tartar in boiling water. 50% madder root (Rubia tinctorum) was simmered for 30 minutes then strained to make a dye solution, in which the wool was gently simmered for 30 minutes.